Credit for this recipe is due to my mother, Diana Edwards, who taught me how to make this. When the heart is still fresh, soak it in a bucket of cold sea water or fresh water to flush out the blood. Rinse well. Trim the fat and the tops of the valves off well so that the final product is mostly red and the top is relatively level, with clear access to the chambers of the heart. At this point, the heart can be kept in the freezer if wrapped well in saran wrap and butcher paper, however it is best when eaten fresh. In a hot skillet, brown the heart on all sides and set aside to cool. Put the celery, onion, garlic, parsley, rosemary, oregano, and sage in a hot skillet covered with a generous amount of olive oil. Add the butter and sauté until tender, about 10 minutes. Add salt and pepper. Cube the bread into small bite-size pieces. In a large bowl, combine the cubed bread and everything from the skillet. Make sure that the mixture is somewhat moist. If more moisture is needed, sprinkle a little water or melted butter throughout the dressing. Taste and add salt and pepper as necessary. Sprinkle salt and pepper into the cavities of the heart. Stuff the dressing into all of its chambers. Put any extra dressing in a small casserole dish with a cover and set aside. Place the heart in a roasting pan. Mix three parts water, one part red wine, and one part soy sauce together and pour enough into the bottom of the roasting pan so that it’s about 1 inch deep. Cover the roasting pan and put into the oven. After about an hour, take some of the liquid out of the roasting pan and drizzle onto the extra dressing in the casserole dish. Cover the dressing and put in the oven. 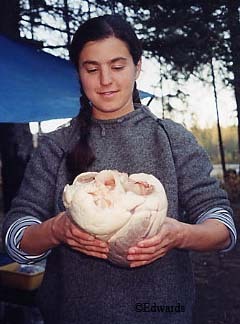 Bake the heart until a knife inserted produces clear liquid – expect it to take a couple of hours at least, depending on the size of the moose heart. Try not to puncture the heart more than necessary when testing for doneness, as this will dry it out. When done cooking, slice the heart diagonally so that most of the slices contain dressing. Thank the moose for giving up his life for you and dig in!